1. Hours: The range, accessible by Card Key, is open at the following times except for scheduled competitions and club events. Please check our Events Page for events and closures. Monday – Saturday 9 AM to 8 PM or sunset - whichever is earlier. Please check our Events Page for events and closures. 3. Posted Rules and Regulations must be read and obeyed by all members and guests. No fully automatic firearms (machine guns). All firearms must be in safe condition. All loading and unloading of the firearms on the firing line only. Target frames provided by the club are the only frames to be used, no exceptions. Do not move any target holders, hang targets from structure or stick target frames in the ground. No cans, bottles, rocks, bowling pins, water bottles, exploding targets, etc. No targets are to be hung from the baffle system or posts*. 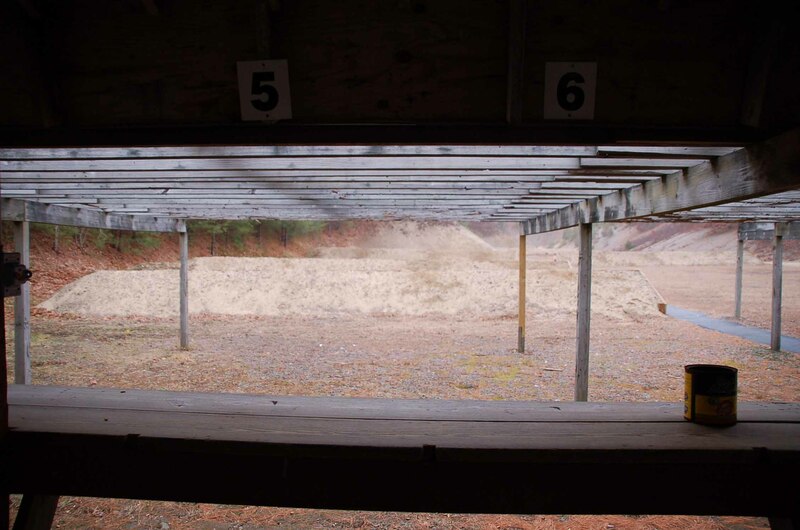 No Sky Range – A system of baffles and posts designed so the shooter from the bench cannot see the sky when aiming down range, designed to mitigate the risk of bullets leaving the range. See picture at top of page. 10 rounds maximum will be loaded at one time. No armor piercing or tracer rounds. Range lights must be ON when anyone is down range. on the bench or in the rack. No one may handle firearms while lights are on. 10. Children are the responsibility of the adult member. 11. Club ID must be presented to any member requesting it while on the range.